Integrating your Memberium membership site with Infusionsoft can be one of the most profitable “marriages” for your business. In short, Infusionsoft helps control what paid (and non-paid) visitors on your member site can see based on permissions that you assign (e.g. tags). You should know right up front that Memberium integrates seamlessly with Infusionsoft. 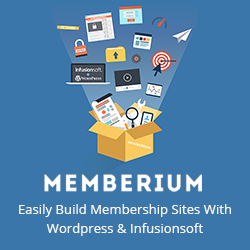 If you know how to install a WordPress plug-in, you can install Memberium and connect it to your Infusionsoft account with ease. At this point, I’m presuming that you have an Infusionsoft account and have created at least one campaign sequence. This is important because it tells me that you have some knowledge of how Infusionsoft works. Once connected, Memberium and Infusionsoft TALK AMONGST THEMSELVES and give you control over what people can see/can not see on your site. Not sure what you can use Memberium for? Oh wow. You are definitely in for a treat! Memberium enables you to add an entire backend of content and deliverables to your website that are segmented by an audience. Want another great use for Memberium? Use Memberium to provide free member accounts to visitors. Then, you can “repackage” your site’s content based on a few survey questions. First, join Memberium and download the Memberium .zip file. Most businesses will need only the $47/month Standard package. But, if you’re serial business owners like us, you’ll find yourself bumping to the $87/month Pro package in no time. Second, once your .zip file has downloaded to your computer, log into your WordPress account, go to plugins, click add new and upload. Once installed, you will notice a new tab with a heart icon at the right of your dashboard. The latest version of Memberium has a “Start Here” tab, which is where you should start. There, you’ll notice a list of tasks and goals you should be focused on as a new Memberium customer. If you’re concerned that Memberium is a “one trick pony,” don’t be. For a more in-depth list of the themes, shopping carts, CRMs, and learning platforms that Memberium integrate with, click here for Memberium’s list of integrations. Once you have Memberium installed, you will want to create your first membership level under Memberium -> Memberships. If you have a tag already created in Infusionsoft that will give members access to the member site, then click on “Create New Membership Level,” name and apply your tag to that level. If you don’t have a tag already created in Infusionsoft, use Memberium’s Tag Builder Pro to handle this for you. Notice the checkbox titled, “Include SUSP/CANC” under the Tag Builder Pro section? You might not have given this much thought, but you will want to assign tags that GIVE your members access to their member area, but also create PAYF (payment failure) and CANC (canceled membership) tags that TAKE AWAY access when needed. No matter how good your onboarding program is, or how nice you are to members, you will experience cancellations. This is when you want automation to kick in. You WANT your Infusionsoft app to add PAYF tag and remove an active member tag when a member’s card is declined. Memberium Partials are bits of content you want to show ONLY to certain people. For example, maybe you have certain members you know will need one-on-one coaching at some point. You know this because you were smart enough to ask a few survey questions when these members joined, so you became immediately aware of their need. Armed with this knowledge, you could create a partial that displays ONLY to these folks. The partial is displayed based on a tag. See what I mean! Memberium (integrated with Infusionsoft) is awesome!!! I’ll write more about how to leverage Memberium Partials in a later post. Integrating Memberium membership functionality to your WordPress site and Infusionsoft CRM can add a new layer of functionality (and revenue) to your business. Are you beyond the “getting started with Memberium & Infusionsoft stage” and need help with in-depth integrations and solutions? If so, contact us about your Memberium/Infusionsoft integration.